so I went with shades of pink. Just right for my little girl! I knew I wanted the cake to have different layers of pink inside, but I thought it would be even better to have the flavor, not just the color change. and yes, it was every bit as good as it sounds. mix each of the cake mixes sepparately according to these directions, rather than the ones on the box. beat all ingredients on low for 30 seconds, and then on medium for 2 minutes. bake one vanilla cake and one strawberry cake. only use half the batter for each. beat he cream cheese so its softened slightly. Add butter and cream together. Melt chocolate according to package directions. Add melted chocolate. Add powdered sugar gradually and cream together. Make sure your cakes are 100% cool befor you start frosting them! 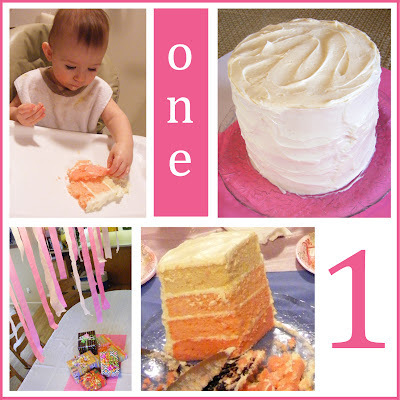 Start with the darkest pink cake on the bottom, frost the top and add the next darkest layer. Continue to the top. Frost the entire cake (top and sides) with a thin layer of frosting (crumb coat). Add lots of thick swirly frosting. YUM! YUM! This looks so good. What a great idea to have varying degrees of pink. Mylee would LOVE this cake. Happy bday to your pretty little lady! Cu-ute! it looks so soft and cute.